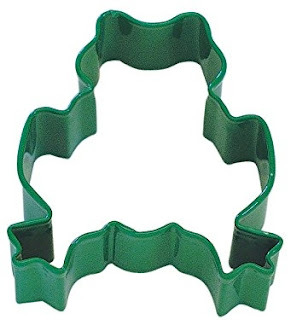 Amazon has got this frog cookie cutter for just $3.71 with free Prime/SuperSaver shipping. As I'm sure you already know, cookie cutters go well beyond cutting cookie dough, and can be used to cut melon, fruit, vegetables, etc. For years, I've been using my Pesach froggie cookie cutter to cut out frog shapes in green peppers, which then go in my Seder-night salad (I must take a picture this year!). Cutting frog shapes in healthy foods like veggies or even cold cuts is also a great way to get your kids to eat something good for them and turn it into something fun. When I used to make kosher la Pesach "noodles" from scratch, I would cut out frog shapes and then float them in my chicken soup and my friends' kids would LOVE it. 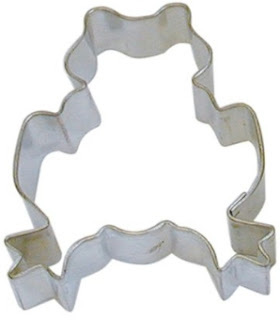 If you prefer using cookie cutters with a coating, Amazon has also got this metal resin-coated frog-shaped Kitchen Craft cookie cutter for $5.06 with free Prime/SuperSaver shipping.